For those of you that don’t know what a Response Time is: Sandra Bendelow marshals a group of writers, artists and performers, takes them to a gallery space, and gives them 48 hours to make some performances in response to the Art in the Gallery (or the Gallery itself and its environment,) which are performed to a public audience at the end of the time. It’s crazy. In October and December, Artes Mundi invited us to create responses to two of its locations (The National Museum in October and the ffotogallery in December). These were the 8th and 10th Response Time events, and the 7th and 8th ones I attended, but they marked a new and exciting phase for the project, and weren’t like anything that came before it. At least in terms of logistics. Normally the events take place in Aberystwyth, with all the participants being more or less local, but these involved trekking down to a CITY. A CITY. And staying there for the duration of the process. It was definitely a bizarre experience, not being able to go home, but it was heart-warming to discover I can maintain a happy, homey, procrastination schedule even in the most unusual of conditions. Home is where you have a corner with a plug socket and a wifi connection. The first event, in the National Museum was the biggest change, the space was vast and… Cold, I guess? Partly that’s down to the sheer size of it (The Gas Gallery, our usual home, could have fit inside it many times over,) and partly the clean and clinical nature of a big, modern art gallery. Lots of big open spaces and clean white walls. It’s hard to say if the work itself was more… cool and alienating than I’m used to working with, or if it was just the space that gave that impression. This had a noticeable effect on, if not my actual process of creation, then the mood of it; usually we’re all working together in a small space, able to observe and chat, but here we could each work individually, undisturbed for long periods. The second space, the ffotogallery in Penarth, was much more like home, and I settled in to it immediately. A lovely, small space. The two processes and performances ended up being fairly radically different. The first was a large group of us (9), responding to lots of different pieces, and taking the audience on a hefty journey around the space, which led to a very choppy sort of thing. It was difficult to achieve a real sense of flow (I didn’t envy Sandra’s Job of jigsawing our work together into a whole. At all.) While the second was a small group (6 of us), responding to 4 artworks, by 2 artists, in 3 rooms, and ended up really cohering, despite the various differences in performance tone, style and energy. I think overall, I preferred the second event, even though the piece I produced at the first one is one of my favourite performances I’ve created, and the piece I made at the second is the first time I’ve really felt like I needed extra time… I just needed another day to really work out what I wanted to say, and how I wanted to say it. If you’re a playwright, a poet, a prose writer (can we start calling them “prosers”? ), an actor, a dancer, a musician, an artist, a photographer, a documentarian, a film maker, a… sculptor(? ), whatever… I cannot recommend getting in touch with Sandra at Scriptography Productions and enquiring about getting involved with one of these things in future. Response time has radically developed my creative practice. There is nothing I’ve found to equal that buzz of adrenaline in going from a standing start to performing to an audience in 48 hours. Being unable to prepare, having to rely on inspiration, or an approximation thereof, and throwing caution to the wind, throwing out perfectionism, and just MAKING ART is an amazing experience, and I’ve been able to take those new styles and practices into my life in general. 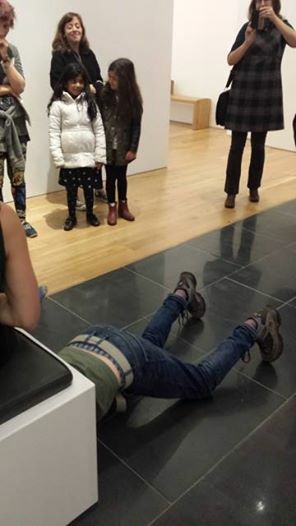 This entry was posted in Uncategorized and tagged artes mundi, Interactive performance, James Baker, National Museum Wales, new writing, performance art on January 20, 2015 by Sandra Bendelow. Crash Test scratch night offers a perfectly informal and fun environment which encourages writers new to writing for performance and more experienced writers to share work in its earliest stages of development. 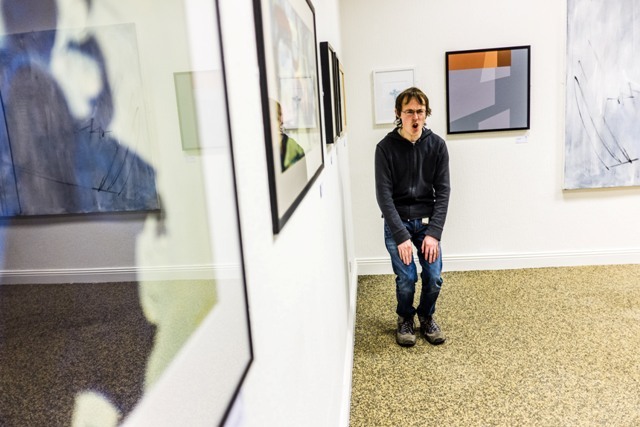 As well as providing an opportunity for Aberystwyth Arts Centre’s Writing for Performance Group to stage work at this bi-monthly event, Crash Test has also begun to attract writers from other areas such as comedy, performance poetry and spoken word. There is an Open part of the evening which is open to anyone to share their writing or performance. The evening will be MC’d by James Baker with his usual incomparable and indescribable mix of comedy, writing, performance and occasionally dance! If you are interested in taking part in this or future scratch nights contact scriptographyproductions@gmail.com or pop along and say hello. This entry was posted in Crash Test, Scratch Night and tagged Aberystwyth Arts Centre, Comedy, Crash Test Aber, Crash Test Dymis, Interactive performance, new writing, Scratch Night, Scriptograaphy Productions, To Kill a Machine, writing for performance group on September 26, 2014 by Sandra Bendelow. March – it’s a little busy! March is going to be a very busy month at Scriptography Productions. First we kick off with Grave Men Near Death at Aberystwyth Arts Centre (Wednesday 12th and Thursday 13th March), then straight into Response Time: Journeys at the Gas Gallery (Sunday 16th March) and then we see the month out with a Crash Test scratch night on 27th March. Grave Men Near Death is a new play by Terry Bailey, who runs the MA Screenwriting course at Aberystwyth University. The play was developed as part of Playpen, an Aberystwyth Arts Centre’s Writing for Performance Group project, short plays on any subject. Grave Men Near Death was a perfect short play and when Terry admitted he had ideas for other scenes and characters I have to admit I was sceptical. Plays are the length they need to be because – that’s it. When writers ask me about play length I always say it will be the length it needs to be. Let’s face it we’ve all sat through plays that needed a good edit or plays that felt empty as though there were some missing scenes drifting around somewhere in the ether. I read the new version of Grave Men Near Death sceptical and expecting to see a fifteen minute play dragged out. But it wasn’t, interestingly the original play was there largely intact but around it were wonderful new scenes and characters which added more depth and layers, it had the heart it started with but it had got bigger and better. As I watched a rehearsal the other day, and did what I always do – watch the writer watching their play – I was as always thrilled to see his delight in watching his work come to life. In a time when we’re constantly being told that new writing is dead, that new writing isn’t worth supporting or prioritising and in a time when there are so few companies in Wales producing work with a new piece of writing at it’s heart – I can’t help but wonder why companies wouldn’t want such an amazing experience of bringing new work by a writer to life, I can assure everyone bringing a new play into the world is magical. Next up will be Response Time, our 48 hour challenge project to produce performed responses to art, space and environment at the Gas Gallery. This time we will be responding to the Sculpture Cymru Journeys: Responses to Place and Barbara Matthews exhibition Hidden Depths. The Response Time project gives a space for writers, artists and performance makers from many different disciplines to play. No better way to describe it really. We spend 48 hours playing – with ideas, working processes, collaborating and then we open the doors and let the audience join in the game. The audience can stand back and watch or they can even join in sometimes. We don’t insist that words are involved – that would be silly! But I do delight when words are included and also when a performance artist is inspired to express herself with words or when a physical performer decides to write a piece or when a writer decides to collaborate with a physical performer and explore a new working process. I’ve always been a little confused by the need to define new writing and new work – and seriously why has so many hours been lost to debating. Also I don’t understand why so many organisations insist on establishing rules for work to be developed – this way, or that way. Or the hours spent defining and analysing what is right or wrong in creative work. Surely every piece is different, surely every piece should be developed the way it needs to be. At Response Time there are no rules – it is a space to play, to have fun, to enjoy. Then finally for this month anyway – Crash Test – a scratch night for work in development – Thursday 27th March. A very informal environment perfectly suited to the living-room like feeling at the Aberystwyth Boat Club Bar. Again there are no rules – if it involves words then I’m happy for it to be shared. This about testing work out with an audience, about writers hearing their words beyond reading them aloud to themselves (I am still constantly astonished by the number of writers who don’t do that). Crash Test is a good name for it – it is about throwing things out there and seeing what crashes and what delights. It’s used as a testing ground for the Writing for Performance Group but also by other writers to test out work sometimes performed by themselves, sometimes performed by others. We provide performers if needed. It is a chance for writers to get used to sharing their work – something that can hinder and hold back so many writers from getting their work out there. It is open to all, again I am not interested in defining things – spoken work, poetry, plays, storytelling, stand-up – if it has words in it we can Crash Test it. So that’s my March – please do come along and see what we get up to. None of these things are possible without audiences. None of us are writing for ourselves, we are all writing because we want an audience to hear our work, and be engaged by it and be excited by it – no matter how it is created, no matter what style it is created in, no matter what discipline or platform so please do come along and see work in it’s many different forms and most importantly have fun following us on our journey as writers and creators. This entry was posted in Crash Test, Performed Response to Art, Scratch Night and tagged Aberystwyth Arts Centre, Branwen Davies, Celf Ceredigion Art, Comedy, Crash Test Aber, Gas Gallery, Hannah Pullen, Interactive performance, new writing, performance art, writing for performance group on March 12, 2014 by Sandra Bendelow. Audiences in Aberystwyth are being invited to share the very first presentation of a brand new play written by Aberystwyth University lecturer Terry Bailey. Terry Bailey runs the MA in Scriptwriting (Screen and Radio) in the Department of Theatre, Film and Television at Aberystwyth University. He also teaches screenwriting at undergraduate level. Although Terry has a background in writing for television and radio, both in Britain and in his native Canada, he had not written for the stage before joining the Writing for Performance Group almost four years ago and Grave Men Near Death is his first full length play. 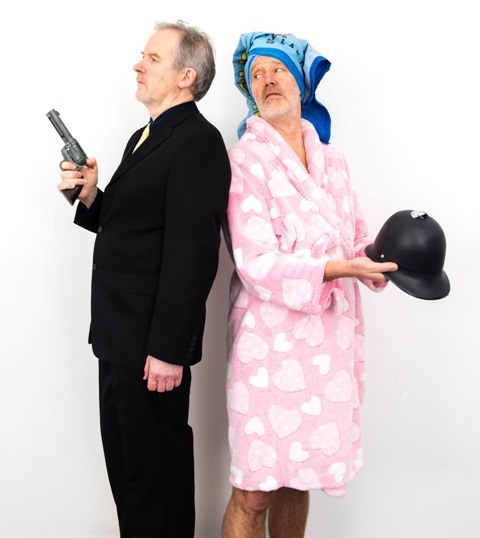 In Grave Men Near Death, two mismatched old men confront mortality – and each other – in this darkly comic play. Old school gangster Eddie is up to no good with hypersensitive aesthete Walter. They’re beset by friends, enemies and victims, without being quite sure which is which or who is using who. In the world of shady dealings, it can be hard to tell. Terry Bailey spoke to us about the play and his experience of developing it from a short play to a full-length play. Q: The publicity for this play has a quote from the director, David Blumfield, which reads, ‘If Harold Pinter had written a sitcom, it might have looked like Grave Men, Near Death‘. How did the idea come about? A: I confess that I had seen a Pinter play just before I got the idea … but the inspiration actually came from a session with students. I run the MA in Scriptwriting in Aberystwyth University’s Department of Theatre, Film and Television Studies. One of my students was giving a presentation, and something he said triggered a whole cascade of ideas. Q: So you started writing a play in your mind, rather than listening to your student? A: Oh, no, I listened to my student, too! I can multi-task. Q: I believe Grave Men, Near Death started out as a short play, didn’t it? A: Sandra Bendelow runs a ‘Writing for Performance’ group at the Arts Centre, which did two evenings of short plays in the Autumn of 2012. I wrote a fifteen minute version of Grave Men, Near Death for that. It went over very well, but even then I knew I wanted to expand it. Q: Your background is in television. Was that your first play? A: Other than a short monologue, which I also wrote for the Writing for Performance Group, it was my first play. Plays impose some different rules than television, but that makes for a refreshing change. It’s fun to be able to include long comic monologues in a piece like Grave Men, Near Death. By and large, though, there are a lot of similarities in dramatic structure between different media, so I didn’t find the process too stressful. In fact, I want to write for the theatre more often. Q: Have you been attending rehearsals? A: Yes, and it’s looking great. We have some very talented actors and a wonderful director. I’ve really enjoyed watching the play take shape. Q: Do you have a favourite character? A: No, they’re all equally grotesque. I mean that in a good way! The play is directed by David Blumfield, performed by Tom O’Malley, Roger Boyle, Stephanie Tillotson, Jim Finnis, Lindsay Blumfield and Joe Blunt. It is produced by Scriptography Productions . It was originally developed for Aberyswtyth Arts Centre’s Writing for Performance Group PlayPen project through the Open Platform. This entry was posted in PlayPen and tagged Aberystwyth Arts Centre, Aberystwyth University, Harold Pinter, MA Screenwriting, new writing, Roger Boyle, Terry Bailey, Tom O'Malley on March 10, 2014 by Sandra Bendelow. 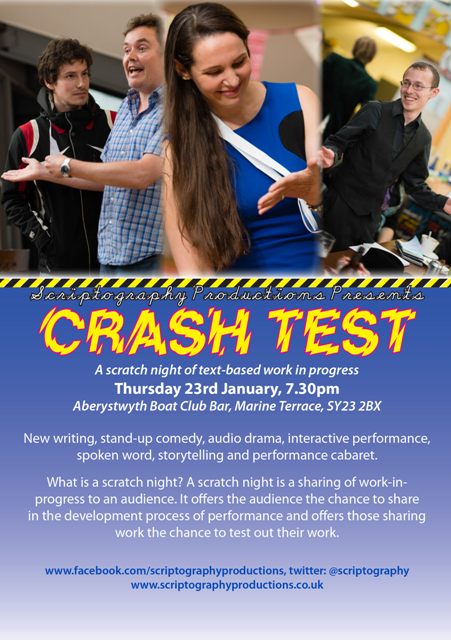 Crash Test returns on Thursday 23rd January at Aberystwyth Boat Club Bar with it’s usual mix of plays, performance text, storytelling and comedy. Crash Test has now been taking place for over two years, it has moved around a little from the RAFA club to Boulders Cafe, Borth and now has found a home at Aberystwyth Boat Club Bar. It is a pub-based evening because it aims for an informal and fun sharing of work in development. We aim to make new and inexperienced writers feel comfortable to share their words. It is not a stage – it’s the bit before the stage. We want the writers to feel as though they’re sharing their work with friends in their living room – though the friends are people they have only just met that night and the living room has a bar in the corner. We also want the audience to feel the excitement and fun of being involved in the very early stages of work. It’s always text-based work – well almost always. There are no rules for inclusion or exclusion – if someone asks to show work and it has words in it then they can be included. Though we’ve also had a few things which didn’t have words! 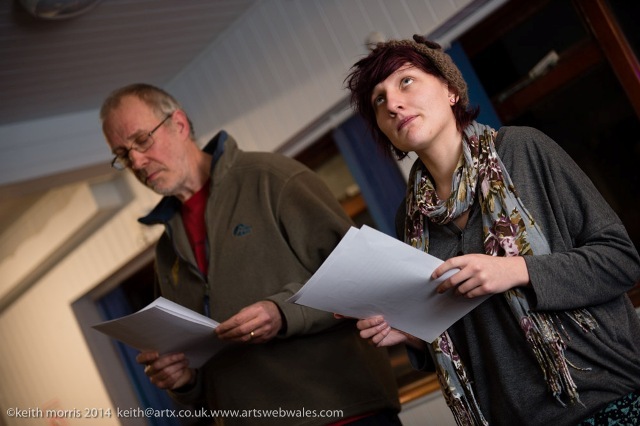 The heart of the Crash Test night is Aberystwyth Arts Centre’s Writing for Performance Group. Though the group do have showcases of script-in-hand work in development which take place regularly at Aberystwyth Arts Centre. The Crash Test night allows beginners to try out their plays in front of an audience at a much earlier stage of development – it also allows writers with a little more experience to test out work. In essence it allows writers to play, to make mistakes, to test. We’re very proud of Crash Test – previous evenings have seen Julie Grady Thomas perform stand-up for the first time, James Baker saw a play he’d written be performed in front of an audience for the very first time. Lots of first times. This Thursday we have more firsts with writers sharing work for the very first time with an audience. We’ll have new pieces from more experienced writers. To be honest we usually don’t really know what we’ll have until the night. That’s the fun of it. We have an open slot too so if you fancy turning up and giving it a go then feel free. Come along to Aberystwyth Boat Club Bar on Thursday 23rd January at 7.30PM. It’s £5 admission and £3 concessions. And it’s free for participants. This entry was posted in Crash Test and tagged Aberystwyth Arts Centre, Comedy, Crash Test Aber, Crash Test Dymis, Interactive performance, new writing, writing for performance group on January 20, 2014 by Sandra Bendelow. 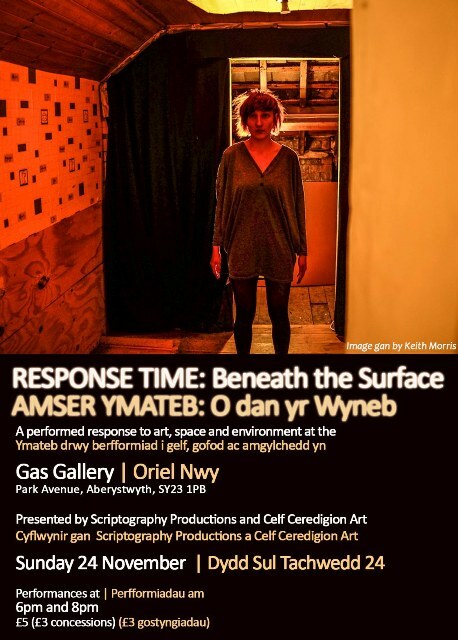 On Sunday 12th January audiences are invited to the Gas Gallery, Aberystwyth to a new performance of work created during a 48 hour challenge to produce performed responses to art currently on exhibition at the gallery. Response Time is an on-going project which is responding to all exhibitions at the newly opened gallery. Performance makers participating are from a wide range of disciplines including theatre, storytelling, performance art and physical theatre. Each project is guided through the weekend by the producer Sandra Bendelow and by a guest curator who takes on the task of piecing together all the different responses into a seamless performance – this weekend’s project will be curated by Vivian Ezugha a student at Aberystwyth University’s School of Art. The project mixes experienced performance makers with students from Coleg Ceredigion and Aberystwyth University and performers and writers from the community. The project focuses on allowing young and emerging artists to develop their work and performance skills in a supportive and friendly environment and offers audiences the chance to experience the art, space and environment through the eyes of these young and emerging artists. Performances are on Sunday 12th January 6PM and 8PM £5 (£3). 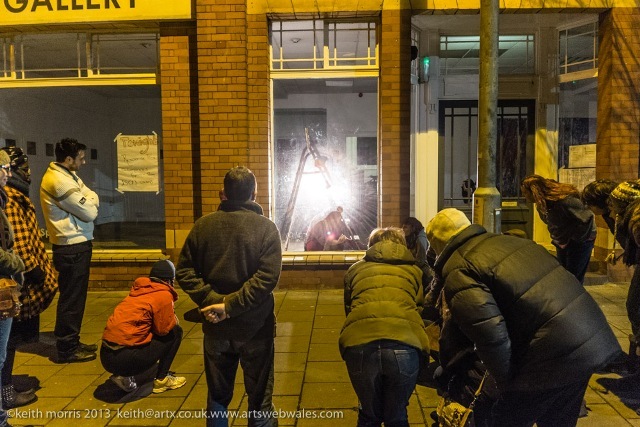 This entry was posted in Performed Response to Art and tagged Art, Audio-plays, Catrin Ffur Huws, Celf Ceredigion Art, Comedy, Environment, Gas Gallery, Hannah Pullen, Interactive performance, new writing, performance art, Site specific on January 10, 2014 by Sandra Bendelow. 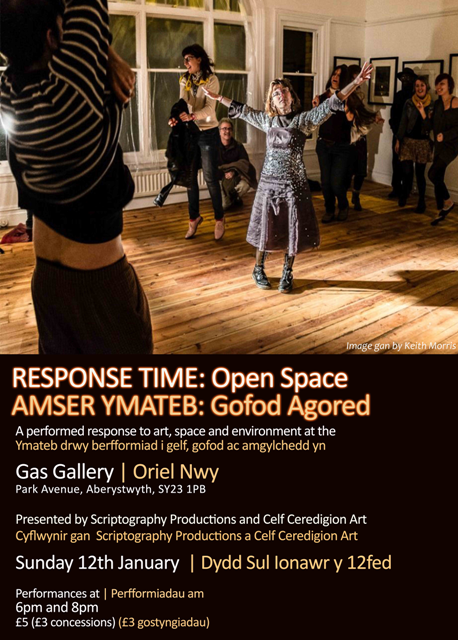 Scriptography Productions will be hosting its third 48 hour challenge to performance makers to respond to art, space and environment at the Gas Gallery Aberystwyth 22nd -24th November. Performance makers will be asked to respond to the art of Catrin Webster and Karen Robbie currently on exhibition until 17th December. So far the challenges have produced an amazingly eclectic mix of short plays, installation, immersive performance, performance art, film, poetry, movement, physical theatre, audio, storytelling and dance. We will be sharing the work produced with audiences on Sunday 24th November for two performances at 6PM and 8PM. Tickets £5 (£3). The Gas Gallery is also open to the public during the weekend Saturday 11 – 5 and Sunday 11 – 2. Please feel free to call in and see the work being developed for Response Time and the current exhibitions. 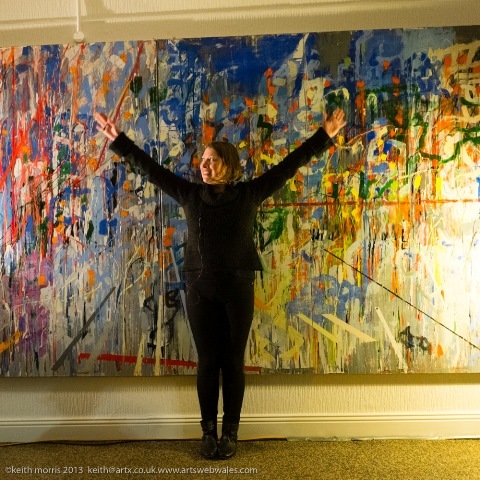 This entry was posted in Performed Response to Art and tagged Art, Celf Ceredigion Art, Environment, Gas Gallery, Interactive performance, new writing, performance art, Space on November 21, 2013 by Sandra Bendelow.